This review by Eric R. Danton appeared in The Wall Street Journal. While Cuba and Jamaica boast perhaps the most prominent Caribbean music scenes, they’re not the only ones: Haiti was a hotbed, too, as demonstrated by a new collection of music from the island nation that includes Super Jazz Des Jeunes’ song “Coté Moune Yo,” which premieres today on Speakeasy. The song comes from “Haiti Direct: Big Band, Mini-Jazz & Twoubadou Sounds 1960-1978,” which compiles 27 songs on two CDs exploring Haitian music that flowered despite the despotic regime of François “Papa Doc” Duvalier in the late 1950s and ’60s. Super Jazz Des Jeunes, lead by the saxophonist and arrange Réné St. Aude, is considered one of the most influential practitioners of one of those styles, compas, a meringue offshoot that incorporated elements of swing and, often, early rock ’n’ roll. 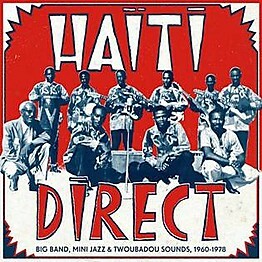 The group is “an institution of Haitian music,” Hugo Mendez, who compiled “Haiti Direct,” wrote in the liner notes, though they recorded “Coté Moune Yo” before the compas breakthrough that followed.“Haiti Direct” is due out Jan. 28 on Strut Records in the U.S., and a portion of the proceeds will benefit Partners in Health, a charity originally founded in 1987 to provide healthcare to residents of Haiti’s Central Plateau region.